Members of the Detroit Derby Girls Travel Team battle The Chicago Outfit Syndicate during a women's flat track roller derby bout in Detroit, Michigan, in April 2011. The women of roller derby are always crashing and smashing into each other, constantly trading bumps and bruises -- and at the same time, they're also trading the microscopic bugs living on their skin. That's according to a new study that used derby to investigate the way contact sports can mix up our skin microbiome. "When I was on the track learning a new move - like 'jumping the apex' - my mind would drift to science and 'microbiome land,'" Green says. "I realized that contact sports are an ideal venue to explore if and how touching mediates the exchange of microbes among people in a group setting." We know, even if we don't always like to remember it, that our skin is teeming with thousands of kinds of bacteria, and we also know that those microbial communities protect us from pathogens and help regulate our immune systems. But Green and her fellow researchers at the University of Oregon wanted to know more about where we get those microbes, and how those invisible bacterial communities are changed and distributed every time we touch each other. "For years, most of what we knew about the skin microbiome came from medical studies targeting important pathogens dispersed between sick people and health care staff in a hospital setting," explains lead author James Meadow, a postdoctoral research associate at the University of Oregon's Biology and the Built Environment Center. "This study enabled us to look at whole communities of microbes being passed between healthy people." And roller derby -- where players jockey for track position by bumping upper arms, hips or, ah, "booty" (seriously, that's the official roller derby nomenclature) -- seemed like an ideal contact sport to study to find out. "Over the years I've noticed it's hard to get folks interested in microbes. Maybe it's because you can't see microbes with the naked eye and they are also are misunderstood as being gross," says Green, whose derby past helped with planning the logistics for co-author Keith Herkert, who did the project for his undergraduate honor's project. 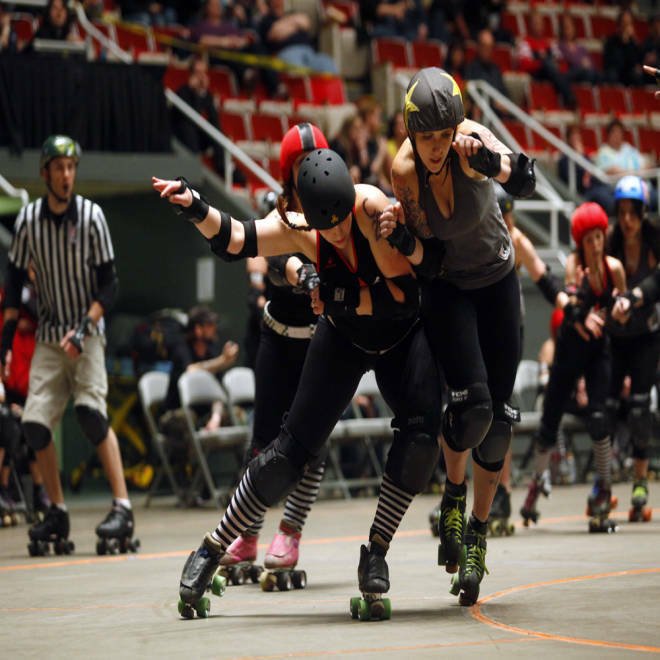 "Adding roller derby into the mix makes microbes a lot more appealing." Women from the Emerald City Roller Girls of Eugene, Ore.; the D.C. Roller Girls of Washington, D.C.; and the Silicon Valley Roller Girls of San Jose, Calif., participated in the study, and all skin samples were collected at the Big O Tournament in Eugene on Feb. 10, 2012. All the women were swabbed in the same small area of their upper arm, one area of the skin that is exposed and frequently bumped during a match, or "bout." After a DNA analysis, the researchers found that teams had similar, distinct microbial communities. "For example, if we had picked a player out at random before they skated in the tournament, I probably could have told you what team she played on," Meadow says. The samples for the D.C. team, for example, contained Brevibacterim, and the samples from the Oregon skaters were similar to the surface samples taken from their home track. But after the teams competed, the hour-long bout mixed up their microbes, leaving opposing teams with more similar-looking microbial communities, the analysis found. Specifically, six different kinds of bacteria - Strepococcus, Sphingomonas, Eubacterium, Porphyromonas, Aerococcus and Methylobacterium - were shared by competing teams after, but not before, the bout. Next, Meadow and his fellow researchers want to understand how long those similarities last, and how sharing our microbes influences our health in the long term. As Green explains it, using roller derby is an easier-to-follow example of how we literally influence each other on a microbial level. "The people we choose to be in community with -- through sports, work, and social circles -- likely influence our personal biome in ways we never imagined," Green says. "Our bodies are home to countless microbes that help define who we are," she continues. "Our health and well-being depend on our microbes. People that have the right cocktail of microbes on their skin, for example, are better positioned to fight off germs or pathogens, because their good microbes out-compete the bad invaders. We currently know very little about where our personal microbial communities come from. Our study suggests that our microbes come, in part, from the people we touch. "